Ralph’s Radio has been around for quite some time. In fact, back in 1949 when the business first started, the name was Ralph’s Radio & T.V. A lot has changed since then. Keep reading to hear more about Ralph’s Radio History and how this company has evolved over the years. In 1949, Ralph Jevne opened Ralph’s Radio & T.V. At this time, the store was at 3316 Main Street in Vancouver, a 1,000-square-foot building that Ralph rented. He ran the business as a sole proprietorship until Orest (Orrie) Rurak became an equal partner in 1953. They made an agreement for Orrie to buy Ralph out and become the owner in one year. In 1954, that is exactly what happened, with Ralph staying on as an employee and Orrie running the company. Back then, with technology just starting to evolve, Orrie worked hard to offer products and services that would be helpful and intriguing to his clients. Most of the business consisted of service work and limited sales of car radios, televisions, console stereos and mantel radios. From the very beginning, Ralph’s made a name as a company that takes care of its clients. Now, more than 69 years later, that is still what you’ll hear from locals when they talk about this great business and their employees. Later down the road, in May of 1955, Ralph Jevne left the business and Cecil Tayes took his position. In the mid-60s, Orrie’s two sons, Dave and Tim Rurak, began working part-time at the store as well, along with Gord Riches. Growing up, Dave and Tim watched their dad work and helped him around the shop in any way they could. In Tim’s words, “I was my dad’s shadow. I wanted to be just like him.” At such a young age, little did Tim and Dave know that Ralph’s Radio would grow to be a large company with many employees. In 1969, Orrie became a partner with Abco Imports Ltd. and began spending most of his time with the new company. This left Cecil and Gord to run Ralph’s Radio. The following year, Dave began working full-time at Ralph’s. Two years later, in 1972, Tim also began working at the family store full-time. It was about 1966 when car stereos were invented. A few years after that, Ralph’s Radio began to see the dramatic effect of this ever-growing industry. Orrie Rurak had worked so diligently at creating an excellent reputation for his business that Ralph’s Radio stayed on top of the new technologies that were quickly advancing and saw a major increase in their sales. Rapidly expanding, it didn’t take long for Ralph’s to outgrow of their location. In December of 1971, it was time to lease a bigger shop. The new store, at 369 West Broadway, was a bigger shop, with a 1,500-square-foot building and a two-car installation garage. Around the same time as their big move, Ralph’s became an incorporated company under the name of Ralph’s Radio & T.V. Ltd. Dave Rurak was now the majority shareholder in the business. From 1972–1976, sales steadily grew and Ralph’s continued to expand the space they were leasing, with 1974 the year that brothers Dave and Tim became equal partners in the business. The company purchased Johnson Mobile, a one-man operation doing sales and installations of car radios and stereos. One year later, it was time to start a distribution division to sell car radio and stereos to car dealerships throughout BC. A few years later, in 1976, they now occupied 3,500 sq. feet at the Broadway location, more than double what they started with! At this time, the owners decided to focus on the 12 V industry and discontinue selling and servicing everything except car stereos and radios. Ralph’s Doubles Their Space Again! With this amount of growth in just a few short years, the team at Ralph’s was definitely doing something right. In June of 1977, they purchased a 5,000-square-foot building at 4 West 7th Avenue in Vancouver. This building housed the warehouse portion of the business as well as the dealer installations and wholesale distribution sales for. Ralph’s now had 20 full-time staff members! In March of 1980, the owners decided to combine both operations into one building and purchased a 13,000-square-foot building at 220 East 1st Avenue in Vancouver. As always, Ralph’s Radio was thinking of their clients when they purchased this building. This big move gave them more customer parking out front, a 1,500-square-foot showroom for retail space and 10 separate installation bays. 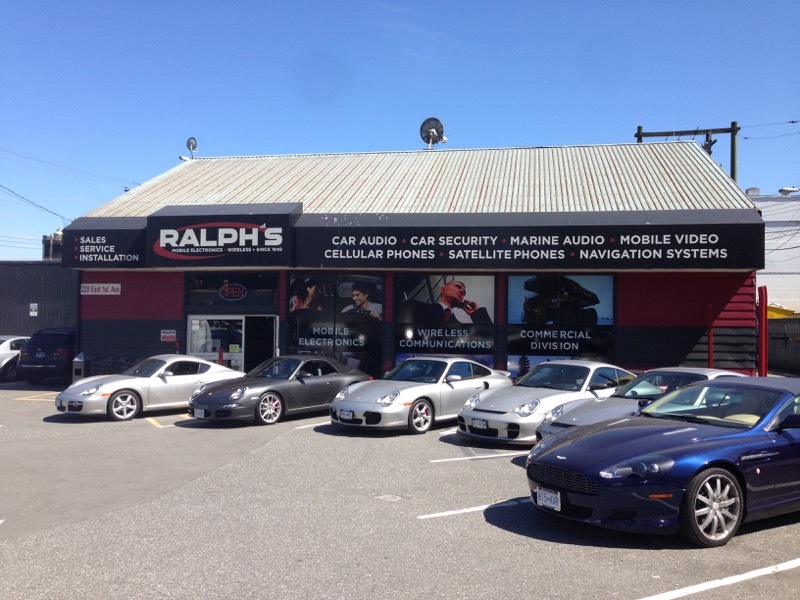 In December of 1980, Ralph’s Radio decided to take a risk and purchase Vancouver Auto Radio Sales Ltd. at 8123 Main Street in Vancouver. This was a four-man operation that sold, serviced and installed car stereos. The following year, they changed the name of this business to Ralph’s Radio Ltd. In 1981, Ralph’s had once again doubled their staff to keep up with demand, this time to 40 members. After owning the second location on Main Street for three years, Ralph’s decided to close it down due to a lack of sales. At this point, they offered all of their employees positions at the main store. The good news was that the main location picked up the business lost from the Main Street location. In September of 1984, Ralph’s branched out into the mobile communications business and become the first authorized sales agent for BC Tel’s Autotel phones. Because they saw tremendous success in this area, BC Tel invited them to become its first authorized agent for their new cellular network. At this time, the car stereo side of business stayed steady for Ralph’s, but they saw exponential growth in the mobile communications division. With the continued growth, Ralph’s decided to undertake three major renovations to their building. The service department, accounting offices and communication showroom all received a new look. It was in August of 1988 that Ralph’s decided to open their own store to sell and install cellular and Autotel mobile phones in Victoria, BC. This store was a rented building at 766 Hillside Avenue including a good sized showroom and a two-car garage. As hard as it is to imagine now, it was only about 30 years ago that mobile phones were being introduced into the world. In November of 1989, Ralph’s strategically set up a cellular direct sales division to market cellular to the government and major corporations. As times changed and more and more technologies were discovered, Ralph’s Radio kept up with the latest products. In December of 1990, Ralph’s decided to enter the two-way radio business and set up its own network, called Pacific Trunking Ltd. It was March of 1995 that the company also went through another renovation, this time installing a new Point of Sale and accounting package. A few months later, another move took place, when they moved the Victoria store to 815 View Street. Extensive renovations took place at the new building. At this time, another change took place in Ralph’s Radio history, when this location began to offer car stereos and alarms to their clients. Over the next 10 years, a few more changes took place as Ralph’s continued to discover where the business was going and where the new technologies were taking them. They continued to renovate and modify their other buildings. In 2010, Ralph’s sister company, Mobileline Systems Ltd., entered into an agreement with Inmarsat Satellite LLC to become a partner and sell Iridium and Inmarsat monthly airtime. Ralph’s became a family business when Orrie Rurak passed his company down to his two sons, Dave and Tim. Now, their sons work for the family business as well. In October of 2005, Dave’s son, Trevor Rurak, began working full-time at Ralph’s, and in 2008, Tim’s son, Tristan Rurak, also came on board full-time. In February 2017, Dave and Tim also decided to change places in the business. After 44 years of serving as president of Ralph’s Radio, Dave decided to take the role of vice president and Tim has become president. Stop by One of the Ralph’s Radio Locations Today! What Orrie instilled in his sons has been passed down the family line. Ralph’s Radio takes care of their customers and that’s why people choose to do business with them over and over again. Whether you’re looking to upgrade your car audio system or need to install a commercial satellite communication system, Ralph’s has you covered. Stop by the Vancouver or Victoria location today or contact them here for more information.